Nissonite: Mineral information, data and localities. Named for William H. Nisson (1912–1965), amateur mineralogist, mineral collector and dealer, of Petaluma, California, USA, who first noted the mineral. This page provides mineralogical data about Nissonite. Mrose, M.E., R. Meyrowitz, J.T. Alfors & C.W. Chesterman (1966), Nissonite, CMg(PO4)(OH)•2½H2O, a new hydrous copper-magnesium-phosphate mineral from Panoche Valley, California: Geological Society of America Abstracts, 1966: 145-146. Glaucophane 1 photo of Nissonite associated with Glaucophane on mindat.org. 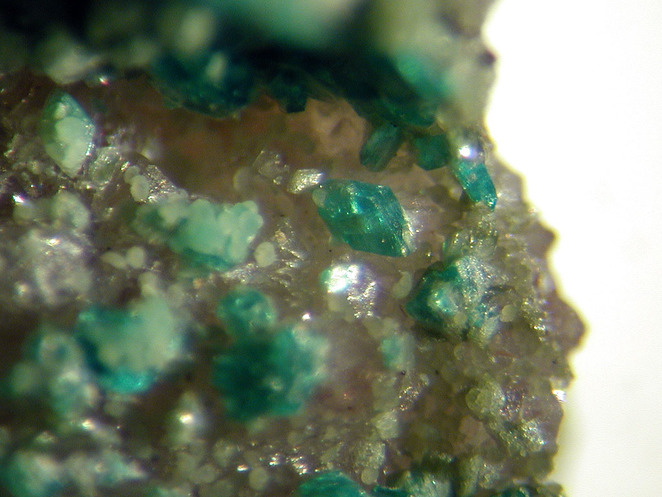 Chrysocolla 1 photo of Nissonite associated with Chrysocolla on mindat.org. 19.2.7 Zapatalite Cu3Al4(PO4)3(OH)9 · 4H2O Tet. Mrose, M.E., R. Meyrowitz, J.T. Alfors & C.W. Chesterman (1966), Nissonite: American Mineralogist: 52: 927. 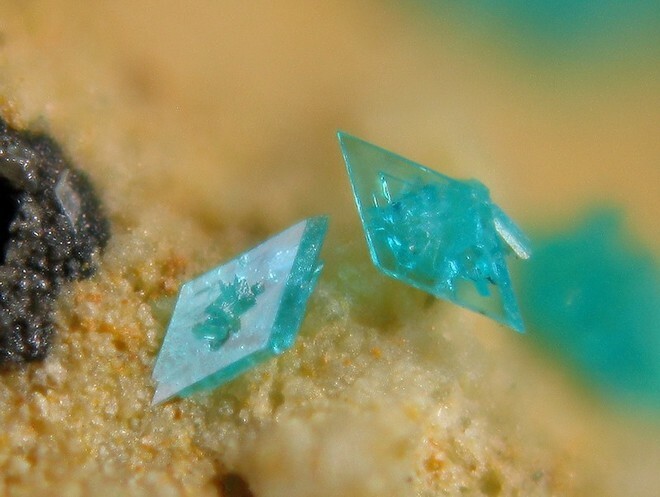 American Mineralogist (1990): 75: 1170-1175. Pring, A., Francis, G. & Birch, W. D. (1992): Nissonite, namibite, and other additions to the mineral suite from Iron Monarch, South Australia. 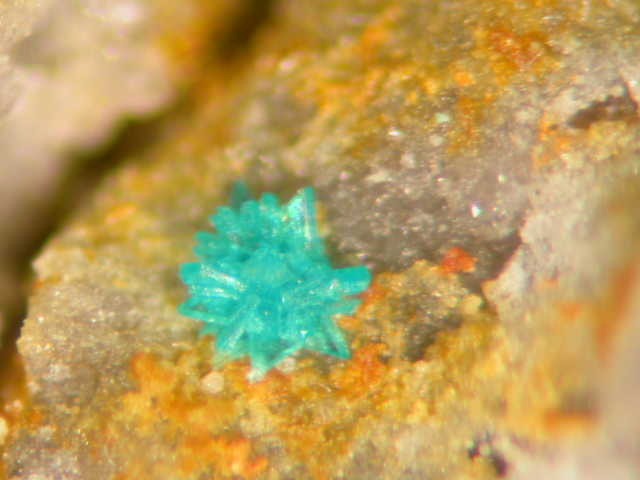 Australian Mineral. 6, 31-39.
da Cunha Sousa, A. K., Gonçalves, D. F., & Macambira, J. B. (2015) Caracterização Petrográfica E Mineralógica de Cavernas Desenvolvidas Como Produtos de Alteração de Rochas Máficas na Unidade Espeleológica Carajás–Sudeste do Pará. In: RASTEIRO, M.A. ; SALLUN FILHO, W. (orgs.) CONGRESSO BRASILEIRO DE ESPELEOLOGIA, 33, 2015. Eldorado. Anais... Campinas: SBE, 2015. p.455-460. Mrose, M.E., Meyrowitz, R., Alfors, J.T., and Chesterman, C.W. (1967) Nissonite. American Mineralogist: 52: 927; Hey, CIM: 498.